ArxDbg is the name of a sample project that has been included with the ObjectARX SDK for many years. It’s primary purpose is to demonstrate how to use the ObjectARX API, but it is a complete free-standing utility in its own right. ObjectARX programmers often use this utility during development for testing and exercising their application code, but it can be useful to anybody, not just programmers. As you can see, the UI consists of a single context menu. One of my favorite features is the ability to spelunk through a drawing database, looking at every object and its relationships to other objects. 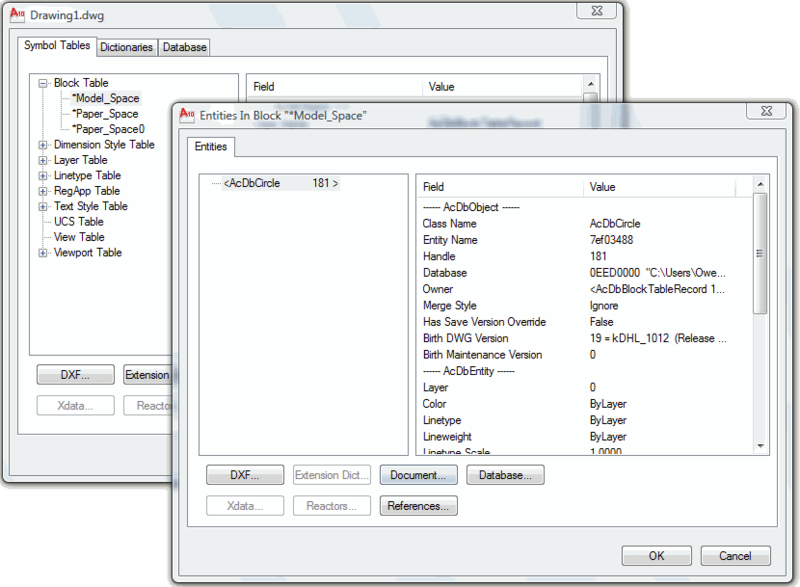 The command is ArxDbgSnoopDb, or you can select ‘Database Info…’ in the ArxDbg context menu. 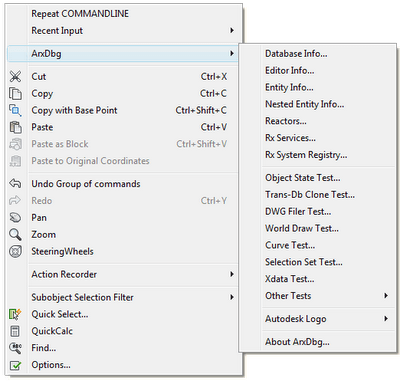 There is no documentation, but anyone with a basic familiarity with the AutoCAD object model can figure out what most of the commands do. [Updated 2018-09-23] ArxDbg.zip [4.3 Mb] includes versions of the utility for all versions of AutoCAD from AutoCAD 2000 through AutoCAD 2019. Je suis entrain de m'initier au .Net avec AutoCAD 2010. J'ai inséré un XRef, un PDF, un DWF et une image dans un dessin. Avec VS2008, j'essai d'écrire un programme qui me permettrait de modifier leur chemin d'accès. Pouvez-vous m'aider ou me dire ou trouver les informations ? I appreciate Your product, is really good and helpful. Did you get an error when loading the version that you downloaded from my web site, or is the error from the version that you built yourself? I have just downloaded arxdbg from Your website, and version for AutoCad 2010 x64 works fine with AutoCad 2012 x64. You must use the v90 platform toolset to build for ObjectARX 2012 in VS 2010. Please post future technical questions in an appropriate support forum if they are not related to the topic of the blog post. I am trying to compile and load the one in “ObjectARX 2013” folder but arxdbg.arx file could not be loaded. I used the source code from the ObjectARX SDK, just built without a manifest as described in my manifest manifesto blog post. I can’t load the ArxDbg. There doesn’t seem to be anything in the C:ObjectARX 2015samplesdatabaseARXDBG folder for an object to load. In the 25 page word documentation file there isn’t a single line on how to load the app. If you’re having trouble building the file yourself, I recommend to just download ArxDbg.zip and use the ones I already built. Thanks for providing the compiled versions….makes it so much easier to use such a great tool. Than you for compiling and providing a download location for this Tool. Your ongoing generosity is appreciated. Just downloaded the 2017 version and felt the need to write to thank you for your ongoing contribution to our lives. Thanks so much for your contribution, You save me a lot of efforts. have you a schedule for the release of the 2019-version? Thanks, Owen – looking forward to the 2019 update. Sorry, a bit late, but it’s finally updated. I want to ask kindly if version 2019 is “under development”? Finally updated, sorry for the delay. BTW: Is there a similar tool for Bricscad?